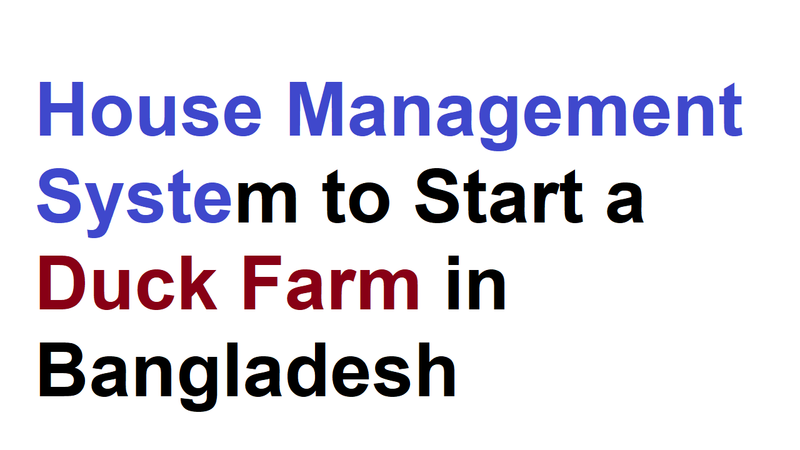 As duck farming is a part of poultry farming systems, it’s essential to know about the house management system to start a farm in Bangladesh. But, there is some fine difference between duck and management system, which is depending on the habits and habitats. We know that ducks are usually raised in order to get enough eggs and meat. Also, duck ranks next to the chicken in terms of egg and meat production in most part of the world. As this business has good potential to earn money egg production, commercial duck farming is increasing. They can easily adopt adverse climatic conditions because ducks are hardy birds than chickens. And since ducks can feed on agro-industrial wastes, swamp, and marshy areas, you can think of starting commercial duck farming. What is House Management System to Start a Duck Farm? The house management system to start a duck farm is one of the first and foremost steps if you want to go through this business. When you have a well-planned housing system, you’ll find the duck farming business is very lucrative and profitable business. Also, you must have access to a water source for raising ducks for commercial duck egg production and breeding. Although ducks can survive without water, they need the water pond kind thing for fertile egg laying and mating. The main facilities and equipment needed to get started are a simple structure except for a brooder. It’s the thing that you need for the first week or so. And a feed hopper or trough made of wood and a simply constructed watering device is important for your firm. A high, well-drained area of the yard is essential for the housing. What are the House Management System Aspects? Because it drains quickly after a rain, sandy soil is preferable for the duck yard. And, where no other agricultural crops could be grown and other livestock rose, these hardy birds can survive in regions. Basically, the design, layout and the equipment are the main aspects of house management system for a duck farm. Well, let’s know about the things relate management system of duck house. Herded flocks under the care of a single herdsman usually range in size from 90 to 130 In Bangladesh. A flock of ducks is allowed to search for food in harvested rice fields and other areas where food is plentiful during the day. But, the flock is returned to a house at night. Usually, the hoses are made of the bamboo pen, where eggs are laid during the night. Whole grains and snails, plus small amounts of insects, leaf material, crabs and frogs are the major part of the diet of herded ducks consists. As often as necessary, it’s the job of the herdsman to move the flock to areas where food is plentiful. And for every new location, portable fencing and other equipment are moved with the flock. As a base camp, it needs to select a grassy area with some protection. For the duration of the season, the birds are housed indoors. Although the birds have access to outside runs during the day, they are locked indoors at night and during adverse weather conditions. It should be gently sloping while selecting a site for your shed as the house management system. Sheds will be difficult to build if the site is too hilly. And, drainage will be impeded if the site is too flat. So, you contact your local expert or duck farmers for development advice for siting and layout. While giving enough headroom, the shed should face north to north-east and should be at least 2 m high at the back. And provide adequate shade since ducks are very susceptible to the excessive sun. First, draw up a ground plan and spend some time thinking about the plan and shed design for a systematic house management system layout. Allow for housing growers and adults separately when planning the farm. Also, avoid keeping drainage from the adult housing area to growers. A cheap and effective type of shed is one with a skillion roof whatever housing is chosen. As it has both litter and slatted or wire floor areas, the ideal method of housing breeding stock is in a building. Improving overall production, it greatly reduces the amount of wet litter. And you need to include on the slats the feeders and waterers. Besides, when there is a combination of litter and slats, it prevents possible leg damage to heavy breeding ducks, which may occur if they are housed on slats only. Nets are other essential aspects of the house management system. Because cleaner eggs result and fewer breakages occur, encourage ducks to use nests. Also, to sun or damp, eggs laid in nests are not exposed. Other than Muscovies, this may be difficult with breeds. As nests should be clean, dry, comfortable and only large enough, it can be used by one duck at a time. And place them in rows along the walls after building them from timber. Use trap nests to facilitate identification of eggs laid by individual ducks if you wish to follow a system of progeny testing. As they continually lay almond-shaped eggs or other misshapen eggs, identify and discard ducks. Besides, encourage Pekin ducks to lie in nests by providing open-framed nest boxes on the side of the walls in intensive buildings. That is manufactured in this country need no special feeding equipment. Ducks need twice as much feeding space as hens as a general rule. And consider providing each duck with a feeding space of at least 12 cm. Although swimming facilities are not essential, pools are essential where outside runs can provide. Place the ponds away from the house to keep litter in the shed dry. Because ducks do need plenty of clean drinking water, swimming water is not necessary.